The history of Defyance goes back better than 25 years, a bunch of Iowa youngsters forming a hard rock and heavy metal band back in 1989. Though having released several albums, between then and 2002, including one with Lance King on vocals, the band has remained in relative regional obscurity. Now, after many passing moons, four of the original members, Doug Beary, Brian Harrington, Marcus Peterson, and Brent Scott, have regathered to cut a new album, aptly titled Reincarnation. One spin of this album and you're going to have deja vu all over again, thinking it's 1989 or even earlier. Defyance plays classic melodic heavy and power metal, sort of the American version of the NWoBHM. The vocals are clean, smooth, often soaring. There's twin guitar harmonies and lead, a staple of the generation. The rhythm section solid, often adding to the galloping pace of the songs. The arrangements are fluid and melodic, yet with some light hints of progressive metal. The sound of the recording is largely crisp and transparent, with no instrument overwhelming another. However, my ears didn't quite catch the bass line on most songs. If anybody gets the boost it's Harrington's vocals, then the guitars. And that's fine with me as there are some great guitar solos here. Within Rangers Lead The Way, From The Ashes, Deeds Not Words being the most noteworthy. After these things, Defyance offers a collection nine originals with one, Passing of the Night, being an original demo version as a bonus track. Of the original eight, I found the first, High Ground, and the last Against You rather uninteresting, never quite grasping my attention. A stand out track, besides the one with the guitar solos, is the ballad Loved Honor More. It's largely vocals and acoustic guitar, but with this impressive orchestration surrounding it. The demo sounds like a demo, nothing as clean as the other eight. Two other bonus tracks come in the form of covers: Fifth Angel's Wings of Destiny and Riot's Sign of the Crimson Storm. Both are quite good. If you're familiar with either band, and I suspect you are, you'll have a sense of where Defyance is coming from. If you think this review sounds like a 'just the facts' with little personal reaction, you're probably right. It's not that I didn't like it. There are some fine songs and the players are quite talented. Yup. Here comes the but. But in the end, as a whole, Reincarnation never quite took hold of me. You may feel different, and encourage you to explore the band more. One spin of this album and you're going to have deja vu all over again, thinking it's 1989 or even earlier. 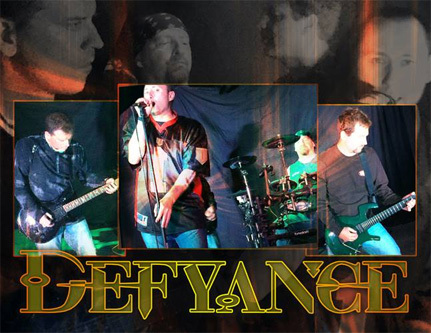 Defyance plays classic melodic heavy and power metal, sort of the American version of the NWoBHM.